The Spoore Merry & Rixman Foundation (click on the logo to access its website for more information) is in the fortunate position of being able to extend its funds to support individuals and organisations who can demonstrate an educational need. Grants are available for school visits, uniforms, residential courses, tuition in music or the arts, special needs courses and aids such as laptops for dyslexic children, musical instruments and sporting equipment. Aside from occasional charity collections (such as for a non-uniform day), the school does not ordinarily accept cash for goods and services. 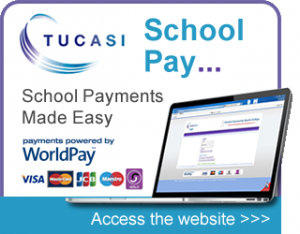 Instead, we ask that parents and carers pay online through Tucasi. For those unable to use online banking, we can accept personal cheques or vouchers by prior arrangement. Tucasi Online Payments Use this secure link to log into the Tucasi portal. A short tutorial for Parents who are about to register and activate their Tucasi online account.